[145 Pages Report] The global MOOC market size is expected to grow from USD 3.9 billion in 2018 to USD 20.8 billion by 2023, at a Compound Annual Growth Rate (CAGR) of 40.1% during the forecast period. MOOC is a course with the option of free and open registration and is a publicly shared platform with open-ended groups. MOOCs integrate social networking and accessible online resources facilitated by leading practitioners in their respective fields of study. MOOC builds on the engagement of learners who self-organize their participation according to learning goals, prior knowledge and skills, and common interests. The need of the scalable and economical educational platform to cater to the need of learners across the globe is boosting the growth of the Massive Open Online Course Market at a high CAGR. 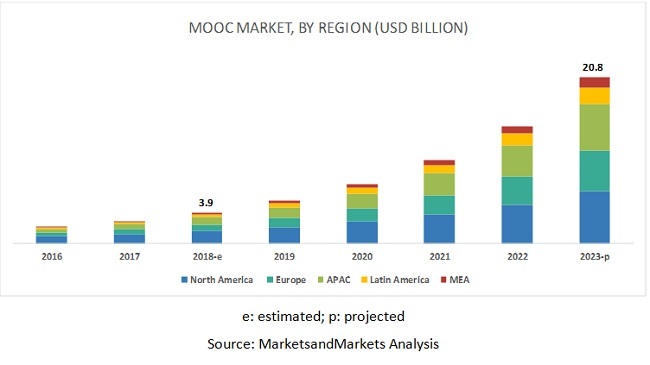 The MOOC market study aims at estimating the market size and growth potential of the market across segments, such as component (platform and services), course, user type, and region. The MOOC market by component covers MOOC platform and associated services. The service segment is expected to outgrow the platform segment and see the maturation in the future due to the higher adoption. Corporates are increasingly adopting the MOOC as a part of their employee engagement and development program. They implement MOOC platforms for various purposes, such as training and development, professional certification, and professional courses for developing their employees’ strategic thinking abilities and improve the production and brand value of the company. The Massive Open Online Course acts as a cost-effective learning platform to enhance the skillsets of the employees and enable organizations to track their employees progress. Education and training facilitates learners with knowledge, values, beliefs, habits, and skills, and helps them to implement the same in various enterprises. In the era of continuous advancements where professional upfront demands adaptation to innovative technologies, education and training courses help teachers, educators, professors, and trainers to enhance their teaching or training skills. These MOOC courses also equip the faculty and teaching staff of universities and colleges to understand the modern pedagogical approaches required by the learners. Several companies have formed partnerships with MOOC market vendors to equip their employees with knowledge, how to implement required skills for competences in particular occupations or more broadly on the labor market. The global market by region covers 5 major geographic regions: North America, Asia Pacific (APAC), Europe, the Middle East and Africa (MEA), and Latin America. North America is projected to hold the largest market size during the forecast period, owing to a large presence of many solution vendors in the US. The Massive Open Online Course Market comprises major solution providers, such as Coursera (US), edX (US), Pluralsight (US), Edureka (India), Alison (Ireland), Udacity (US), Udemy (US), Miríadax (Spain), Jigsaw Academy (India), Simplilearn (US), iversity (Germany), Intellipaat (India), Edmodo (US), FutureLearn (UK), LinkedIn (US), NovoEd (US), Open2Study (Australia), WizIQ (India), Skillshare (US), XuetangX (China), Federica (Italy), Linkstreet Learning (India), Khan Academy (US), and Kadenze (Spain). The study includes in-depth competitive analysis of key players in the MOOC market with their company profiles, recent developments, and key market strategies. The players in the market have embraced different growth strategies to expand their global presence and market shares. New product launches and upgradations, partnerships, agreements, and collaborations, have been major growth strategies adopted by the leading players from 2016 to 2018, which helped them innovate on their offerings and broaden their customer base. In October 2018, edX introduced 9 new Master’s degree programs from top global institutions in highly in-demand subjects, such as data science, cybersecurity, computer science, analytics, and supply chain management. The enhanced version of the MicroMasters Program can be stacked into a fully online Master’s degree program, thus strengthening the Master’s degree application. In June 2018, LinkedIn partnered with LMS providers - Cornerstone OnDemand and SAP SuccessFactors - to boost LinkedIn learner’s growth and reach on respective company websites. IN March 2018, Coursera partnered with 5 universities to expand its Master’s and Bachelor’s degree offerings to drive more learner base. IT would help the company expand its presence in universities to provide full degree courses. What are the drivers, restraints, opportunities, and challenges of the MOOC Market? Which are the leading players operating in the Massive Open Online Course Market? How is the market segmented into different courses, user types, and components? How is the market segmented into 5 major regions–North America, Europe, Asia Pacific (APAC), Middle East and Africa (MEA), and Latin America? *Details on Business Overview, Platforms Offered, Recent Developments, SWOT Analysis, and MNM View might not be captured in case of unlisted companies. The study involved 4 major activities to estimate the current market size for MOOC platform and services. Exhaustive secondary research was done to collect information on market, peer market, and parent market. The next step was to validate these findings, assumptions, and sizing with the industry experts across value chain through primary research. Both top-down and bottom-up approaches were employed to estimate the complete market size. Thereafter, market breakup and data triangulation were used to estimate the MOOC Market size of segments and subsegments. The market size, in terms of value, have been determined through primary and secondary research processes. This research report categorizes the MOOC market based on component, course, user type, and region.